Bagels are one of my favourite breakfast foods because they are so versatile and different from your normal bread and rolls. I like to eat my bagels with butter and jam or bacon and eggs, and sometimes if I am feeling adventurous I may have homemade peanut butter with banana. Bagels don’t have to stop at breakfast though, they can be enjoyed at lunch with salmon and cream cheese or ham and salad as something different. Over the last year though, I have found that the price of bagels seems a little high for what you are getting, at $4.95 for four bagels it was starting to become a treat to have them as I could spend my money on a loaf of bread and rolls. Today though I decided to make my own using a recipe from online at Taste.com.au. I have put the recipe below and I have added a few comments about how I went with making them. Combine the warm water, yeast and half the sugar in a small jug. Set aside for 5 minutes or until frothy. Combine the flour and salt in a large bowl and make a well in the centre. Pour yeast mixture into the well and stir until mixture just comes together. Turn onto a lightly floured surface and knead for 10 minutes or until dough is smooth and elastic. Place in a large bowl and loosely cover with plastic wrap. Set aside in a warm, draught-free place for 30 minutes or until dough rises by half. *When I was mixing the dough in the mix master I found it was not combining as well as it could have and leaving a bit of flour behind, so I added another dash of water and it came together quite well. I also found the dough stuck to the sides of the metal bowl when it was rising, I would suggest maybe flouring the bowl or put spray and cook before setting aside. Preheat oven to 180°C. Combine extra water and remaining sugar in a large saucepan over high heat; bring to the boil. Reduce heat to medium; bring to a simmer. Brush an oven tray with oil. Divide the dough into 12 even portions. Roll each portion into a ball. Push a lightly floured finger through the middle of the ball to create a hole. Gently flatten the ball slightly. Place on the oiled tray and set aside for 10 minutes to rise slightly. 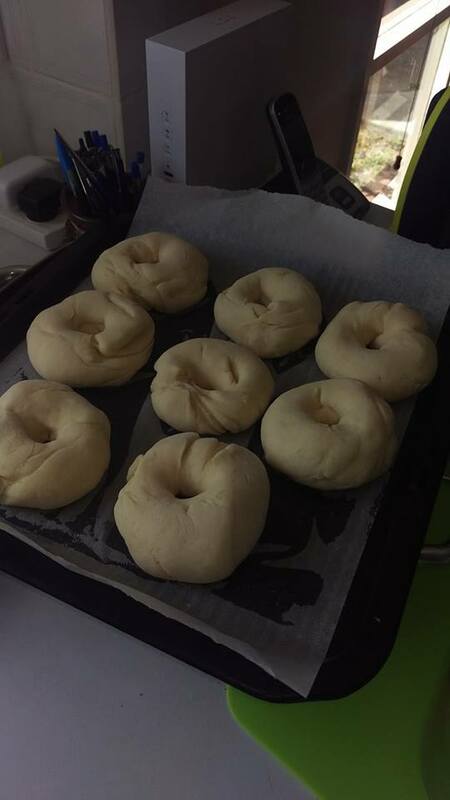 Add 4 of the bagels to the simmering water and cook for 3 minutes. Use a slotted spoon to turn and cook for a further 3 minutes. Use the slotted spoon to remove and transfer to oiled oven tray. Repeat in 2 more batches with remaining bagels. Whisk the egg yolk and milk together in a small bowl. Brush evenly over each bagel and sprinkle with poppy seeds. Bake in preheated oven for 20 minutes or until golden brown and cooked through. Remove from oven and set aside to cool. * My oven may be different but I found putting the bagels on the middle shelf didn’t really brown them on top. If your bagels do the same thing, move the tray to the top shelf to get a nice golden brown colour on them. I also found when toasted the bagel burns a little so keep and eye on it when in the toaster. I would definitely make these again as they came out quite well in the end, next time I may even add sesame seeds or poppy seeds on top. 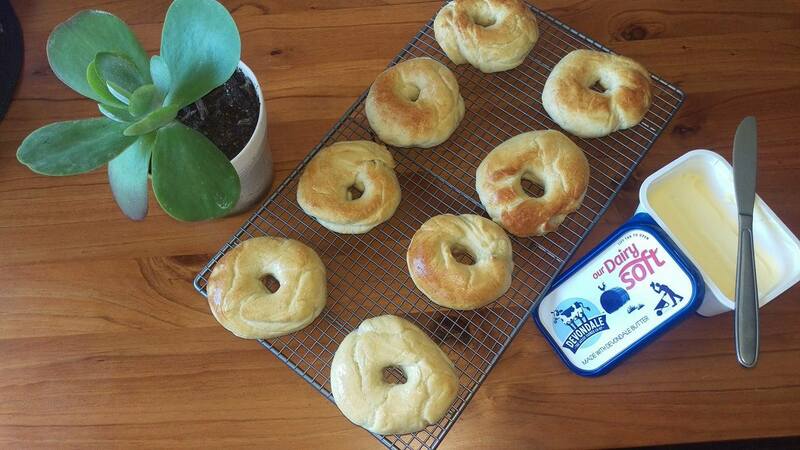 If you end up making bagels comment down below with any tips or tricks we would love to hear them.